The Bash is Back! Celebrating ASAP's 30th Anniversary! The ASAP Way: Exploring BIG Ideas! Partnership and collaboration are the foundation of ASAP. 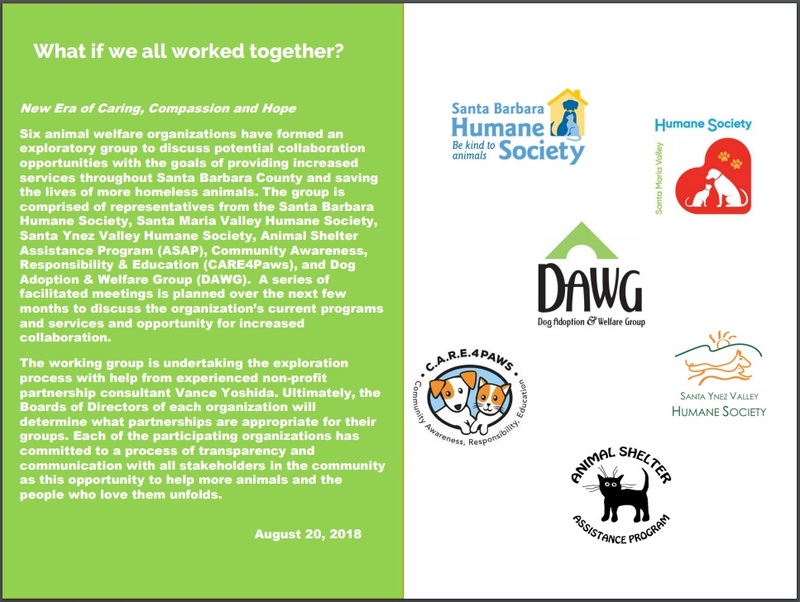 Over the past 29 years, our barrier-breaking public-private partnership with Santa Barbara County Animal Services has been the envy of municipalities nationwide, not to mention the strength of our leadership and collaboration with many, many other nonprofits and organizations over the past three decades! Always searching for opportunities to do more for the precious felines that we serve and save, ASAP is now pushing into new and exciting territory: exploring different models to expand our future impact. 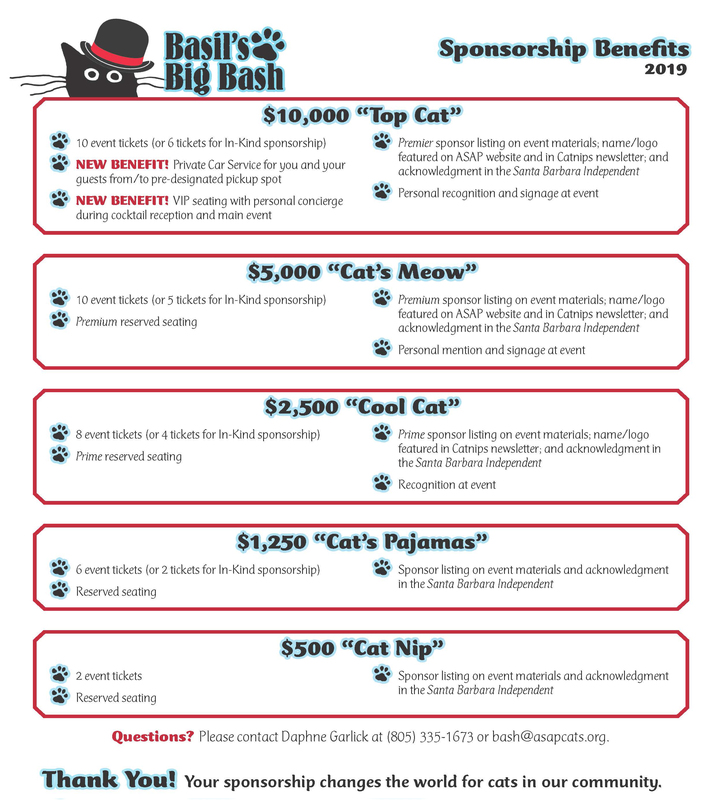 Imagine if we could bring the other non-profit animal shelters together and leverage our resources and talents and create economies of scale—an integrated, highly talented leadership team with a collaborative fundraising approach—leading to more funds for program services and smarter use of donor dollars? We think that's a brilliant concept definitely worth exploring, and ASAP, along with the Santa Barbara Humane Society, Santa Maria Valley Humane Society, Santa Ynez Valley Humane Society, Community Awareness, Responsibility & Education (CARE4Paws), and Dog Adoption & Welfare Group (DAWG) have all agreed to a series of facilitated meetings where we are exploring interesting ways to partner and work together. There have been no public announcements and no announcement to the press. Instead our current focus is TALKING about some BIG ideas, and our discussions are facilitated with an experienced third party consultant. We will certainly keep you posted and we truly welcome your input along the way as we go through this exploratory process. We are convinced that by working together ASAP can expand our mission impact and we can save even more animal lives! 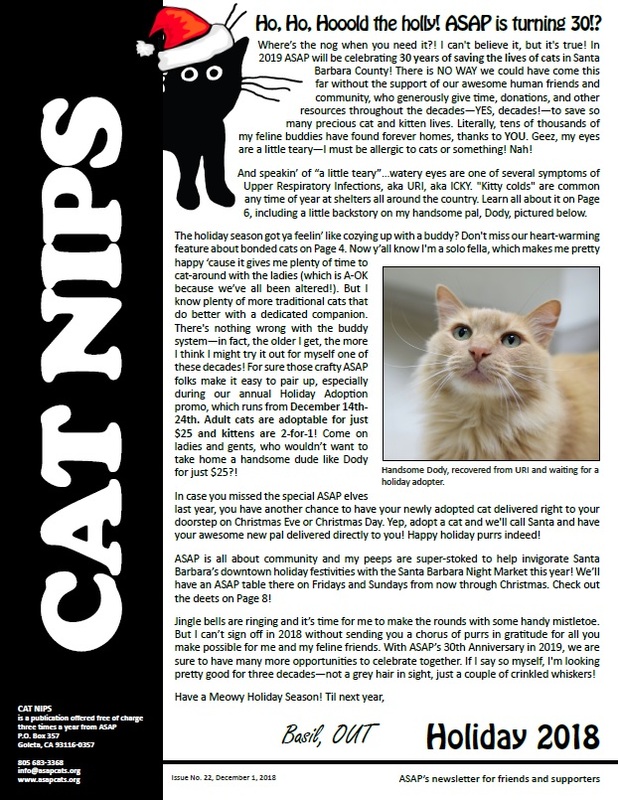 ASAP is the place that takes in cats with unique needs, extreme health concerns or behavior issues who, for one reason or another, individuals or other shelters cannot or will not work with. But no matter the reason, at ASAP, we only ask ourselves… can we help this cat? Can we help them live a better life? Can we improve their health? Can we help them not bite, scream, or charge at or run from people? And more often than not, through love and dedication, and with your support, the answer is yes. Learn more in this year's ASAP video, featuring: Coal Porter, Tiger, Cheerio, Ashe, Little Bit, and Tabitha. Questions? Click here to learn more about Amazon Smile.